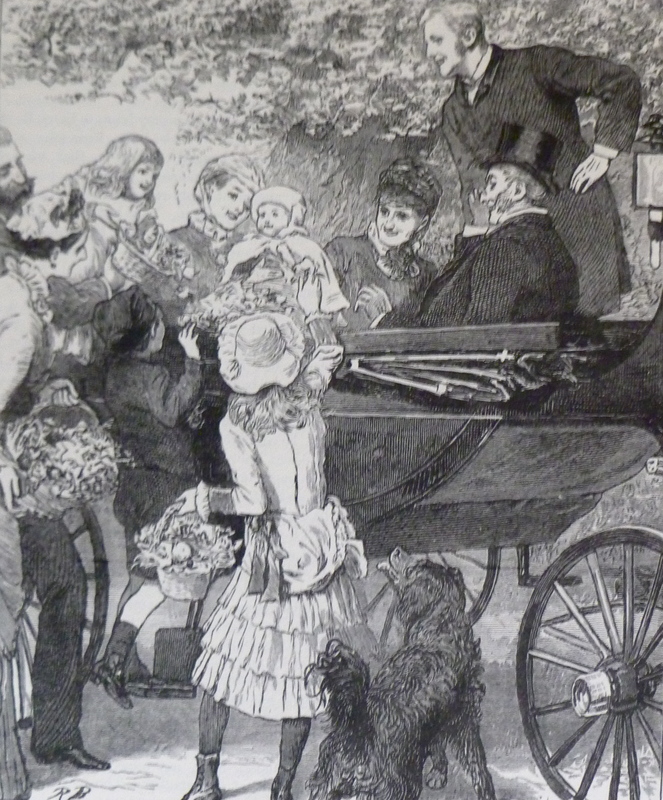 1864; Sutton Poyntz and wedding celebrations. The surrounding areas to Weymouth were and still are prime farm land, and as such they had been worked throughout the centuries. In the Victorian era, and of course before even then, rural life was very much divided into 2 groups. You had those who had the lot… land, money and prestige…and then those who had very little! The harshness of the life of a simple farm labourer and his family often depended on how well his boss and often landlord, treated them. 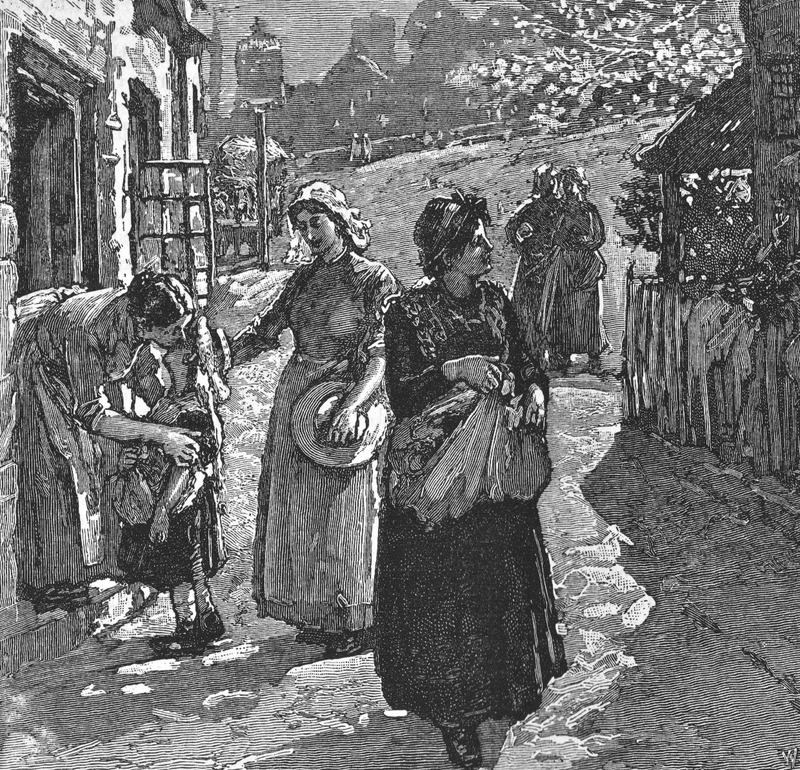 Such was the case for the village of Sutton Poyntz. John Allen Pope, along with his wife Mary were the proud owners of Sutton Farm, (part of the vast Weld estate) working a total of 1950 acres of land in and a round Sutton Poyntz, which pretty much covered the whole area. The wealthy couple had a large family, 7 sons and 4 daughters. On the 9th June 1864 the bells of the village church in Preston rang out their joyful peals. Their notes of merry ringing carried down through the valley, they marked the marriage of two of John and Mary’s daughters. Charlotte, aged 22 was being wed to 25-year-old Thomas Hill, a gentleman, whose parents worked Came farm, and 27-year-old Harriet was marrying another Winterbourne Came resident and gentleman farmer , 37-year-old William Frank Ellis. Rather oddly, the banns for Harriet and Williams marriage had been called over a year earlier in the parish of Winterbourne Came. The family and the labourers celebrated side by side, the two newly married daughters mingling with one and all at their wedding feast day, it appears that a great deal respect was mutual on both sides of the divide. Festivities went on until darkness fell, when one by one the families staggered their way home to their cottages, filled with good food, ale and great cheer. 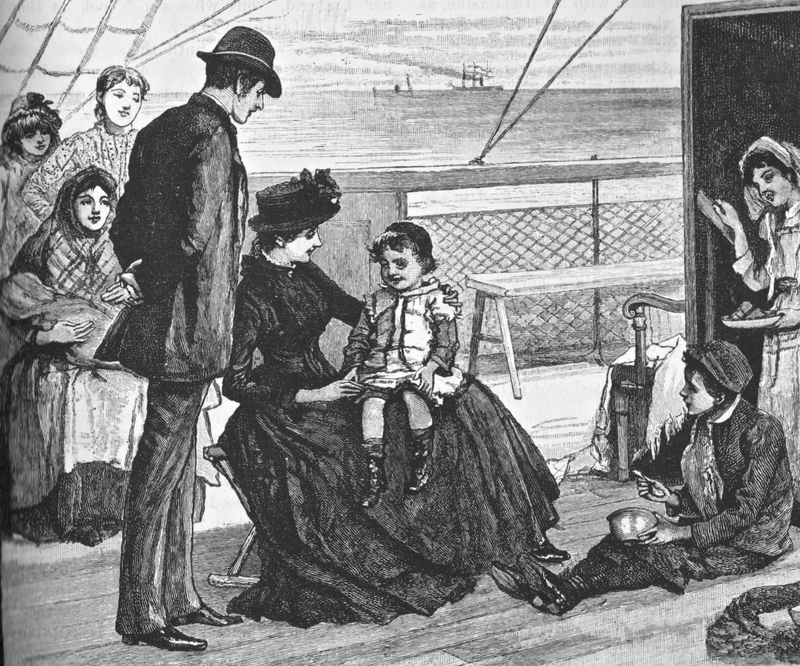 Both women, along with their husbands were destined to leave for pastures new, a life in South Africa. If the name Pope rings a bell, that’s for a very good reason. Two of John and Mary’s sons brought into an established Dorchester brewery, which at the time was named Eldridge, Mason & Co, soon to be renamed Eldridge Pope. 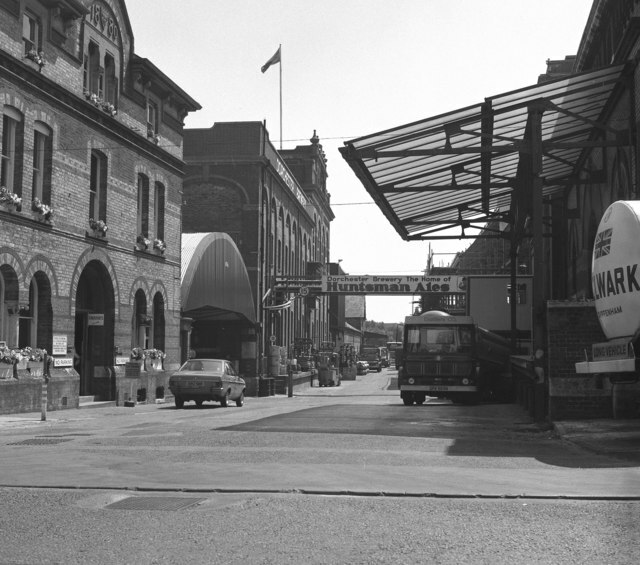 A decade or so later, the brothers purchased the site neat to the station at Dorchester, which became the large brewery that was familiar to one and all. The overpowering aroma of the hops in the air would be unmistakable as you climbed down from the train. buildings redeveloped into luxury apartments, a cinema, shops and restaurants. Previous Post 1883; Weymouth and the Great Western railway. A signal-mans tale. Next Post 1896; Tragedy at Upwey mill, Weymouth. I was delighted to read your aticle 1864 Wedding Celebrations at Sutton Poyntz. I am a relative of Charlotte Pope and although I was born in Sevenoaks, England, I am in touch with the South African branch of the family. It so happens that 2014 is the 150 anniversary of Came Natal, and my Cousins are organisng a major Celebration at Came, which is still in family ownership. I am trying to put together some information on the family before 1864 and although I have much information about the Pope family I know nothing about the family of Thomas Hill. I also see that Charlotte’s two eldest children Alice and Arthur were born at Clifton why? whereas my Grandmother was born in Natal. Do you have any information on the above or indeed anything on the farms of Came or Sutton? Also may I take an extract from your article to send to my Cousins? So glad that someone passed by my blog whose relatives were involved in one of the stories, I see from your address that your family is still in farming? Im afraid that I have no more information other than that which I researched from the local newspaper archives and Ancestry website. I do believe there is a link to the Sutton Poyntz website at the bottom of the page? maybe someone on there might be able to furnish you with more information, or at least point you in the right direction. Feel free to use any bits of the article that you like. Which Local Newspaper Archives did you research? The information came from a short article in the Dorset County Chronicle dated the 16th June 1864. It is on page 3 of the paper. Just one last question, did you go to the library, if so where? or were you able to look at it online, if so how? I would very much like to know. I have tried to view newspapers at the British Library but have not quite managed it. I have a subscription for British Newspapers Online, which makes for fascinating reading. Be surprised what you can dig up about your family in the papers, i’ve found a couple of messy divorces splashed across the media! I am on to it, you have introduced me to many hours reading!!! Just a little point: the weddings would have been at the parish church in Preston. The small chapel at Sutton Poyntz had disappeared at least 200 years before. Its site is not known, but an archaeological excavation carried out for Wessex Water about 20 years ago found a building just west of the waterworks that may well have been the lost chapel. You can find more information at http://www.suttonpoyntz.org.uk/index.php/history/documents-sources/evidence-for-chapel. Thank you Bill, duly amended. articles I like are very good thanks.